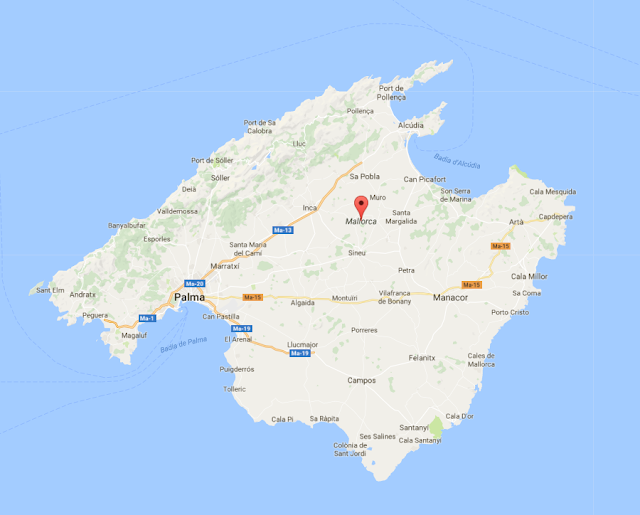 Last week I visited Positivistas David and Juliane on the Spanish Mediterranean island of Mallorca, where they are hard at work on the 18th century (and earlier) farmhouse and "finca" (estate) that is their new home and the future P.E. Mallorca clubhouse. Stephen C. came over from London for the weekend to join us on a number of rides and catch a Saturday feast (whole pig roasted in "el horno", the wood-fired stone/brick lined oven). We missed MOB, Jerome and other friends, but had a wonderful week! I had never been to Mallorca before. Of course, I was curious since I knew that MOB and Stephen go regularly, and David and Juliane have decided to make it their home. But I had not really been paying attention. I knew that it is a major beach vacation destination, so I guess I was expecting a kind of beach-town environment for spring break. I did not actually read the press asking, is this the greatest destination in the world for cycling? What I found was thus a bit of a surprise -- a real Mediterranean gem, with beautiful villages like Tuscany and Provence, a real European city in Palma (whose old town Juliane guided me through one morning, on foot), perfect weather -- cool nights, warm days, spectacular stars -- and LOTS of really great cycling routes. For cycling the island is a bit small to have the kind of "epic" rides one finds in some places -- the climbs are generally not that long (the longest we did was about 700 meters of elevation gain, and the entire island is only 3640 square km -- maybe 70~75 kms long and 60km across at the widest points. 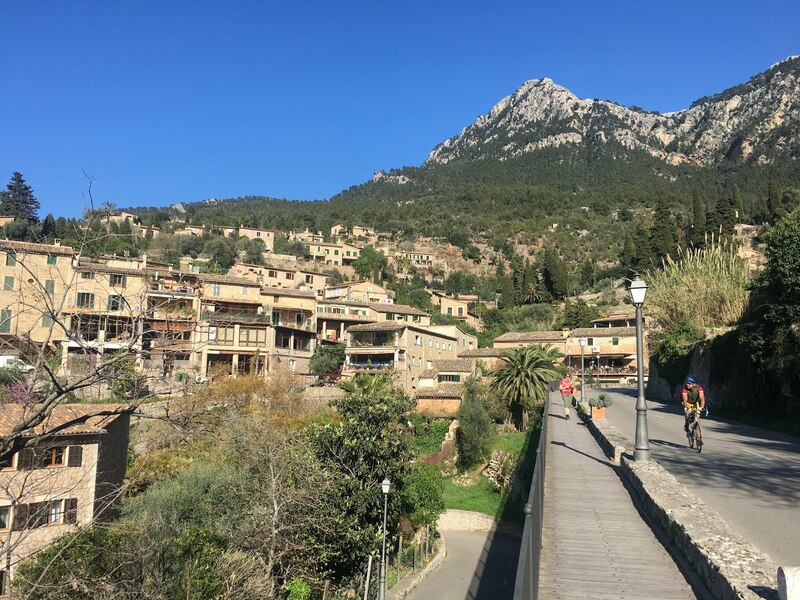 The most interesting rides tend to involve the mountainous area the runs along the northern 25% of the island, but we also rode across the plain and rolling hills to Randa and up the climb of an isolated mountain toward the South, to the Santuria de Cura, and it was lovely. 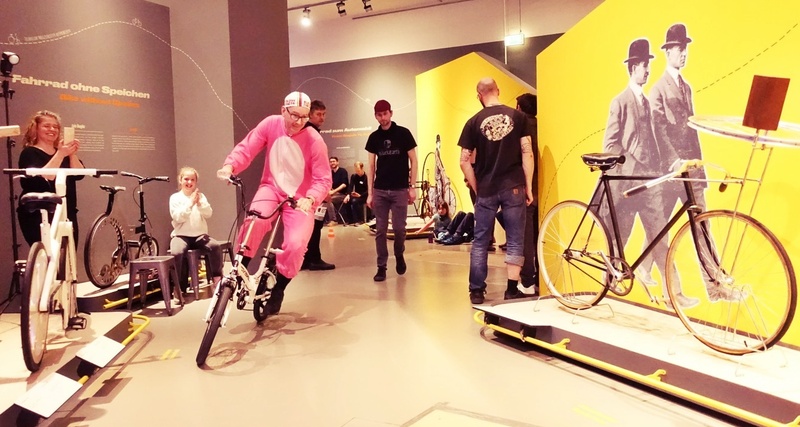 On many roads there were more road cyclists than cars. Most routes were very low traffic, and high cyclist. What cars there were were very careful -- no doubt they EXPECTED to see a cyclist coming at them as they rounded each corner. It makes a huge difference. Anyway, I do not have time to report at length, but will give a bit of info on our rides, and post a few photos. 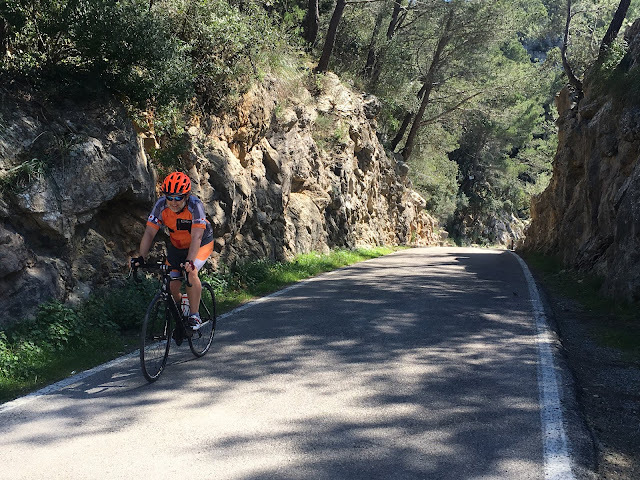 Please believe me when I say that EVERY cyclist -- not just those from Germany, Netherlands and the UK, should get at least one, and hopefully many, trips to Mallorca! All the rides were 50-100 kms in length, and none over 2000 meters of elevation gain. 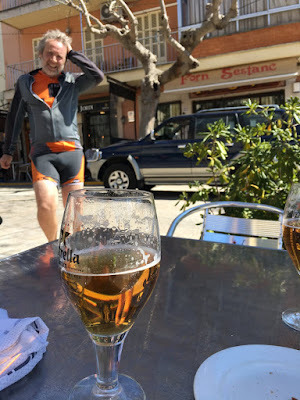 And the pace was usually relaxed (the return from Randa and a few of the climbs being the exceptions), with plenty of photo and coffee stops, and energy left to enjoy the rest of the day off-bike. But the cumulative effect was that I left Mallorce feeling rested and in much better condition than I arrived. 1. Ride #1. 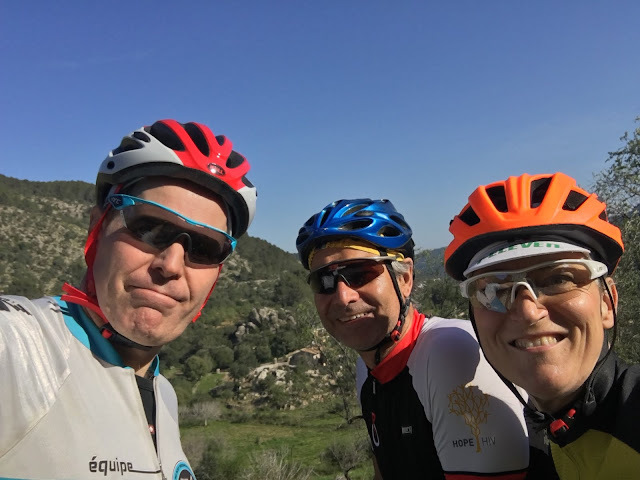 Loop from Esporles past La Granga museum, then over a climb to Puigpuyent, then a second climb to Galilea, then Es Capdella, Calvia, Etabliments, and back. 51kms and 920 meters elevation gain according to Strava. Beautiful! 2. Ride #2. 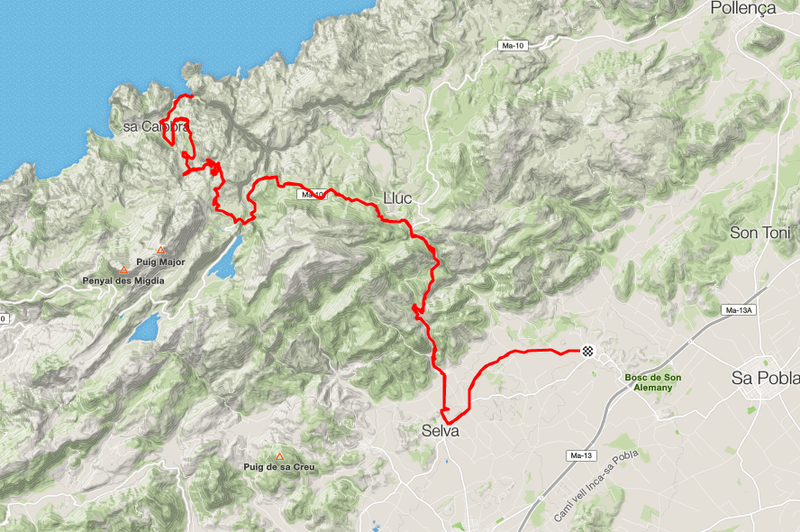 From Capinet to Selva, Caimari, up to Col de Sa Bataia, then along MA-10 and down Port de Sa Calobra, ... and back. Sa Calobra -- one of the iconic climbs of cycling, and the earlier climb from Caimari also fantastic. 80 kms and 2000m of climbing. 3. Ride #3. 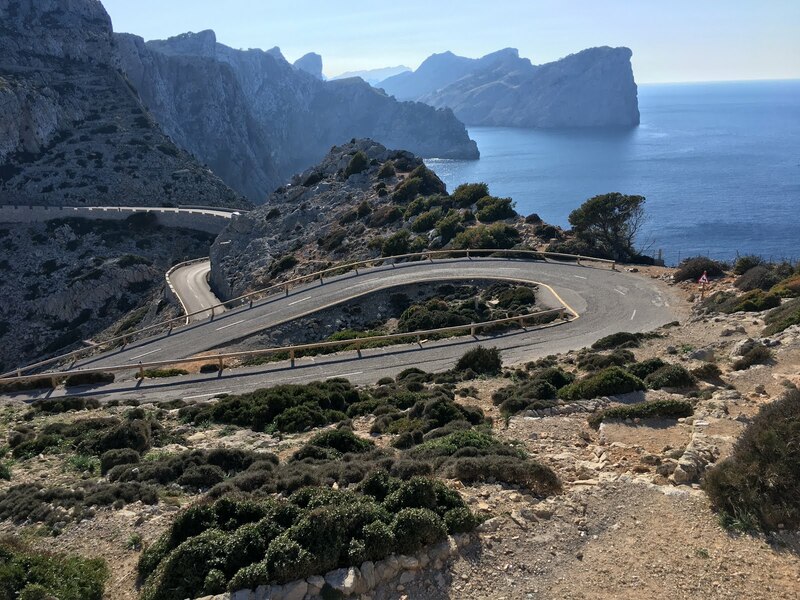 From Pollença to Cap Formentor -- a spectacular jutting peninsula on the NE corner of the island. 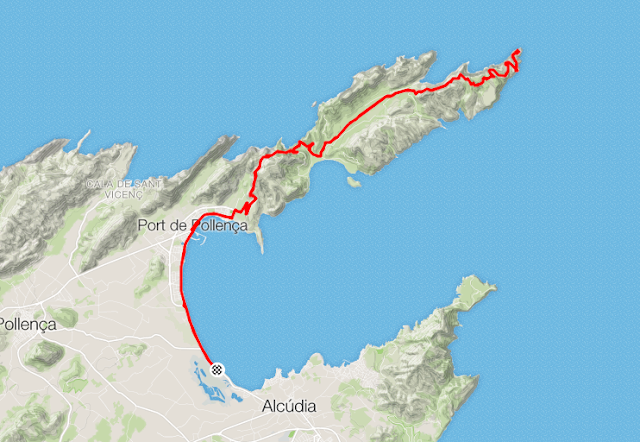 This is listed by many as one of the best 2-3 hour bicycle rides in the world. 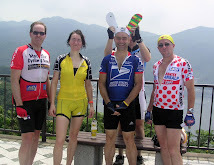 51 kms and 1030 meters of climbing. 4. Ride #4. The first loop again, but this time in the opposite (clockwise) direction. And an important mid-ride stop. 5. Ride #5. 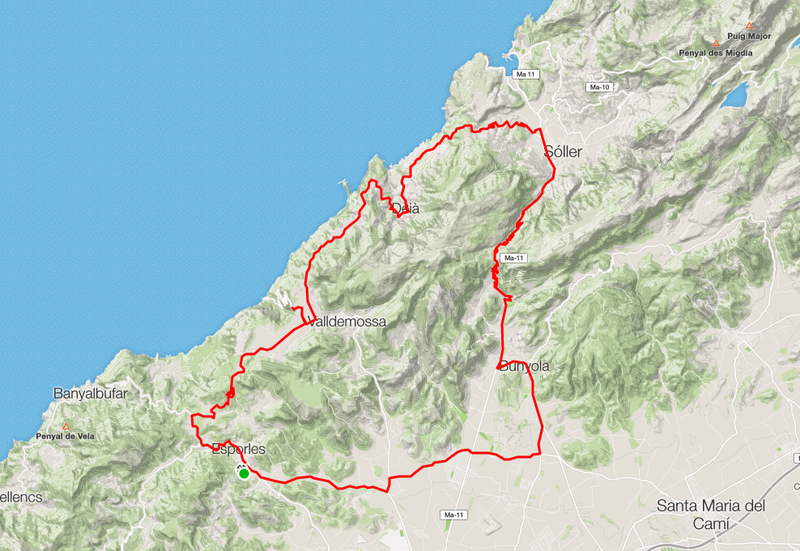 From Esporles to Randa and up the hill to Santuria de Cura, via Santa Maria del Carni and Algaida and back. 96 kms and only 806 meters of elevation gain, though it felt like more on the approach route we took to, and climb following, Randa. 6. Ride #6. Loop from Esporles to Bunyola, over the old road pass to Sóller, back along the hilly North coast to Deià, Valldemossa and over a short climb and down to Esporles. 67kms and 1400 meters of elevation gain. Really incredible to have this ride on the doorstep!